“Am I wrong” is a song by Delta blues musician Keb’ Mo’ from his second studio album Keb’ Mo’. 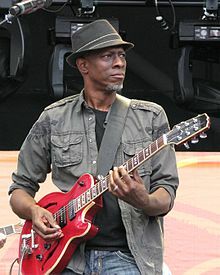 Kevin Roosevelt Moore, known as Keb’ Mo’, is four-time Grammy Award winner known for an unique post-modern blues style influenced by many eras and genres, including folk, rock, jazz, pop and country. This entry was posted in Music and tagged blues, bts, grammy, guitar, Keb' Mo', Kevin Moore, music, song, song of the day. Bookmark the permalink.